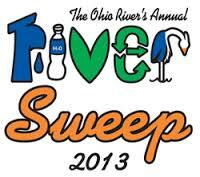 2013 Clark County Ohio River and Silver Creek Sweep is Saturday June 15th! The Clark County Ohio River and Silver Creek Sweep is Saturday June 15, 2013, from 8:30 – 11:30 a.m. and we need your help! Volunteers including scout troops, community/civic/student organizations, families and individuals are invited to help us clean up our riverfront and creeksides at the Falls of the Ohio State Park, Ashland Park, Lapping Park, & Charlestown State Park. All volunteers must register at one of the check-in locations in the parks listed above in order to participate. Gloves, trash bags, bottled water, a FREE 2012 ORSANCO tee shirt, and FREE admission to Falls of the Ohio Interpretive Center will be provided. Volunteers can cool down from the heat with a mister system at the Falls of the Ohio State Park location! Check in stations will open at 8:30 a.m. and the event ends at 11:30 a.m. Permission forms will need to be signed in advance for any minors in groups. Families checking in with kids can sign the forms at check-in. pharmaceutical drop off at the Ashland Park location. This is a great opportunity to properly dispose of unused medicines! The Clark County River Sweep is sponsored by the Clarksville Stormwater Department in coordination with Falls of the Ohio State Park and Clarksville Parks Department; Ohio River Sweep is orchestrated by ORSANCO-Ohio River Valley Sanitation Commission encompassing over 3,000 miles of Ohio River shoreline between Pennsylvania and Illinois.